Certified to DIN 4422 and HD 1004. Tough polyurethane castor wheel leave no marks on floor, and provide resistant to oil and chemical. It equipped with Double Foot Operation Pedals for better handling on brake and release function. A Self Locking brace with quick and simple release catches. Braces come with colour codes for individual models to ease stock management and for simple & quick erection. Aluminium platform, with long lasting and lighter design, provides larger opening, 700 mm, for easy access. 20 kg Ballast come with proper handle for added rigidity to the base. Frames are available in variance height. It provides greater flexibility to maximize versatility and choice of different to platform height. Built-in ladder gives increase user safety. 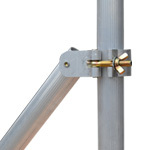 Ribbed frame rungs are non-slip and provide secure handholds during erection and dismantling. To ease the assembly when erecting special design tower, such as, cantilevel, twin tower and etc. 3 different lengths of stabilizer provide better stability with more cost efficiency. 6 meters stabilizer longest in the range can be separated into half for better mobility and storage. Grooved grip of stabilizer ensures sliding of grip does not happen. Simple locking mechanism to allow erection of aluminium scaffold tower without using any tools. Provide 2 types of aluminium base plate. Fixed base plate and swivel base plate are caters for different ground condition. Wide aluminium adjustable base plates design for better rigidity. 350mm threaded track height on adjustable leg to provide better leveling and rigidity on the tower. Reserved 300mm non-threaded area to prevent fallen off from the frame by over adjusting it. 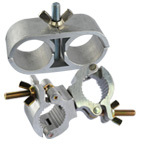 Shorter rib grip extrusion spigot eases erection & dismantling process and avoids the frames from sticking together. Spring clip as a captive locking device to provide additional safety by preventing the frame from being lifting unintentionally. 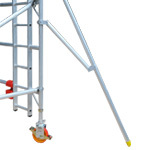 Easy Access Ladder come with landing platform provides you easier and safer access to working platform. 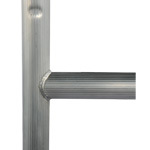 Side handrail designed to be use with Easy Access Ladder for better protection.